HSL - Hue Saturation Luminance. 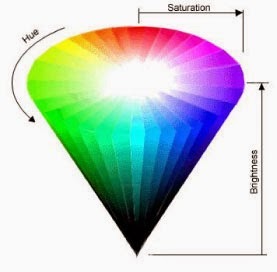 Hue defines the color of a pixel such as red, yellow, green, and blue or combination of two of them. It is related to wavelength of a light. Saturation refers to the amount of white added to the hue and represents the relative purity of a color. If the saturation increases, color becomes pure. If colors are mixed, the saturation decreases. For example, red has higher saturation compared with pink. Luminance is closely related with the brightness of image. Extracting the luminance values of an HSL color image results in a good conversion of a color image to a grayscale representation.